It’s much more than a bucketlist ride. Your gift entry will get them fitter, involved in new social events and above all allow them to achieve totally unforgettable memories. 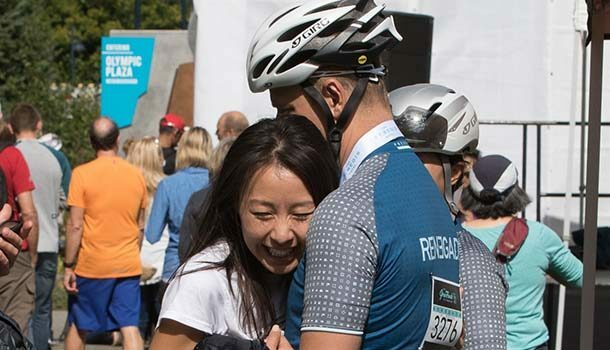 The RBC GranFondo experience is lifechanging. We actively support the community to bring people together through events like summer parties, free group rides and volunteer movements, run training programs to build fitness, confidence and create social opportunities, and then throw one rip-roaring incredible event and celebration that gives people an amazing sense of accomplishment. The gift of a goal might just be the best thing you ever give. Your gift entry is ready instantly. We’ll email you with your personalized code and printable voucher, so they can receive it right away. Gift them Alta Classe entry and they’ll be treated like the star of the show. No lineups, all-inclusive food, drink and service, plus the priority treatment all weekend. Trust us, they’ll be thanking you for a while. We’ll send you a gift entry certificate that’s printable straight after checkout. Go ahead, change their life.